Tokyo Marathon 2012 (東京マラソン2012) is one of the major Marathon event in Japan. It's held in February or March. About 36,000 runners join and about 2 million audiences cheer them from the streets. As the fun run Marathon, it is almost the same size of NY Marathon. The runners start at Shinjuku Metro building and travel Shinagawa, Ginza, Asakusa and finish at Ariake (Tokyo Big Site). 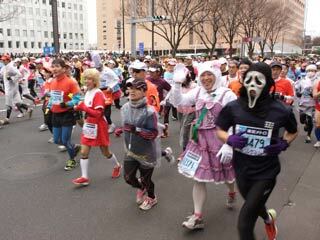 Some of runners wear cosplay costume to stand out. There is a huge street regulation during the race. You can get a cheering map at the Metro Station. They start at Shinjuku Metro Building→ Iidabashi → Hibiya Park → Shinagawa → Hibiya Park → Ginza → Asakusa → Ginza → Toyosu → Ariake (Tokyo Big Site). It was started in 2007 as the large scale international fun run marathon. Over 36,000 runners join this marathon and over 2 million audience cheer. Drawing of lots for the runner is highly competitive. If you make a new world record in this marathon, you can have special prize! They start at Shinjuku Metro Building→ Iidabashi (6 km) → Hibiya Park (10 km) → Shinagawa (15 km) → Hibiya Park (21 km) → Ginza (22 km) → Asakusa (28 km) → Ginza (34 km) → Toyosu (38 km) → Ariake (Tokyo Big Site). The course of Tokyo Marathon is highly designed for followers. It depends on how first the runner is, but if you can cheer one runner for couples of different locations by using Metro Subway. Most of the Metro stations have the special cheering map for Tokyo Marathon which tells the running times of each spots for each speed of runners. You can watch their starts, cheer at middle point and wait for them at the finish line.